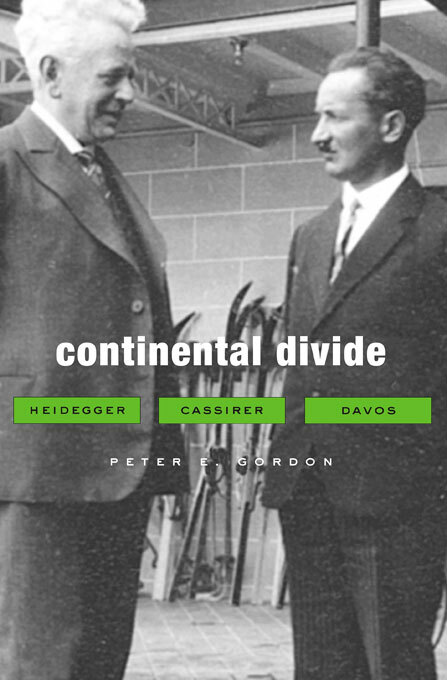 In the spring of 1929, Martin Heidegger and Ernst Cassirer met for a public conversation in Davos, Switzerland. They were arguably the most important thinkers in Europe, and their exchange touched upon the most urgent questions in the history of philosophy: What is human finitude? What is objectivity? What is culture? What is truth? Over the last eighty years the Davos encounter has acquired an allegorical significance, as if it marked an ultimate and irreparable rupture in twentieth-century Continental thought. Here, in a reconstruction at once historical and philosophical, Peter Gordon reexamines the conversation, its origins and its aftermath, resuscitating an event that has become entombed in its own mythology. Through a close and painstaking analysis, Gordon dissects the exchange itself to reveal that it was at core a philosophical disagreement over what it means to be human. But Gordon also shows how the life and work of these two philosophers remained closely intertwined. Their disagreement can be understood only if we appreciate their common point of departure as thinkers of the German interwar crisis, an era of rebellion that touched all of the major philosophical movements of the day—life-philosophy, philosophical anthropology, neo-Kantianism, phenomenology, and existentialism. As Gordon explains, the Davos debate would continue to both inspire and provoke well after the two men had gone their separate ways. It remains, even today, a touchstone of philosophical memory. This clear, riveting book will be of great interest not only to philosophers and to historians of philosophy but also to anyone interested in the great intellectual ferment of Europe’s interwar years.